In the second half of the nineteenth century, culminating in the emergence of germ theory and the microbiological turn, medicine as a whole increasingly oriented itself around a concept of disease specificity. Disease was no longer thought of as a general process manifesting itself uniquely in each individual, but as a specific entity with distinctive signs, symptoms, cellular pathology, and a typical course and outcome. Medicine increasingly emphasized the rational investigation of biological mechanisms or physiological abnormalities in the laboratory or on the autopsy table. By contrast, American alienism – the term used through the early twentieth century to describe the branch of medicine devoted to disorders of the mind – seemed left behind to grapple with the protean, inscrutable and seemingly intractable nature of insanity in increasingly overcrowded, understaffed and physically decaying asylums and state hospitals. 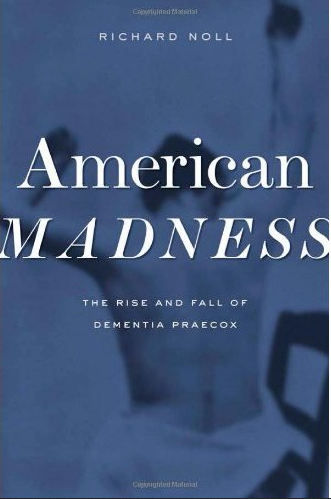 Noll argues that by adopting and adapting the European concepts of dementia praecox to the American context, leading American psychiatrists transformed their field into a branch of modern medicine. Historians of American psychiatry, pulled toward the historiographical black hole of conflicts between partisans of Freudian psychoanalysis and the bio-pharmacological turn of the past few decades, have paid far too little attention to the influence of German psychiatrist Emil Kraepelin in the first four decades of the twentieth century. Noll’s book goes a long way toward remedying that. He devotes an excellent chapter to describing how Kraepelin revolutionized psychiatry by replacing a static view of insanity as a single entity that could express itself in a number of characteristic forms in particular patients – melancholia, mania and finally terminal dementia – with the idea that mental disorders could be sorted into distinct categories based on a rigorous, quantitative study of how clinical symptoms manifested over time. This work established two main categories – manic-depressive inanity and dementia praecox – distinguished primarily on the basis of the deteriorating course and bleak prognosis of the latter. Manic depressives improved between acute episodes, and sometimes recovered completely. Patients with dementia praecox very seldom did. Most of the remainder of the book explores how American psychiatrists like Adolph Meyer introduced and adapted Kraepelin’s methods and concepts into American psychiatry. From a series of increasingly influential positions – first as head of pathology at the Worcester Hospital in Massachusetts, then director of the New York Pathological Institute, and finally professor of psychiatry and head of the Phipps Psychiatric Clinic at Johns Hopkins, Meyer trained nearly every psychiatrist who rose to a senior administrative position in American asylums in the first half of the twentieth century. Meyer learned Kraepelin’s methods and nosological system during a six week visit to his clinic in Heidelberg in 1896 just as the revolutionary fifth edition of Kraepelin’s textbook was published, and returned to the United States a confirmed Kraepelinian. He was enthusiastic about Kraepelin’s methods and concepts not only because they provided a scientific basis for psychiatric research, but because they provided a rationale for asylum doctors to take a more active interest in the patients who crowded their wards. Thanks to the influence of Meyer and a few other elite psychiatrists like August Hoch and E.E. Southard, dementia praecox, which did not exist in American psychiatry in 1895, became in the space of a decade the mental disorder most widely written about in American medical journals and most frequently diagnosed in American psychiatric institutions. Although Noll’s book mostly focuses on the thought-world of elite psychiatrists, he recognizes that most American alienists practiced in a much different world in which limitations in their training, and the lack of resources and clinical demands of the institutions they worked in, made it very difficult for them to follow the psychiatric literature published in English, let alone read Kraepelin’s original work in German. Noll argues that in their hands, Kraepelin’s classification scheme became something of a diagnostic blunt instrument – with mixed results for patients. To the good, Kraepelin’s emphasis on clinical observation restored interest in patients and their symptoms, and Noll thinks it likely that some patients benefitted simply from the increased attention. Moreover, since the major categories of mental disorder were distinguished by prognosis, giving patients a diagnosis allowed alienists to say something about the future to patients and their families, and a diagnosis of manic-depressive insanity gave grounds for some hope of recovery. To the bad, Noll argues that the rising prominence of dementia praecox facilitated continued neglect. The dire prognosis of dementia praecox, which Noll estimates to have been the diagnosis for between one quarter to one half of institutionalized patients during this period, justified non-treatment or mistreatment. In addition to the slipperiness of diagnosing dementia praecox, many leading psychiatrists, including Meyer, were frustrated that it implied nothing about the cause of mental illness. Kraepelin had rejected the “brain psychiatry” that developed in Germany in the 1860s and ‘70s because he thought its focus on finding the cause of mental illness in specific brain pathology was reductionist and premature. He thought that the first priority of a scientific psychiatry had to be using rigorous clinical observation to establish disease concepts that corresponded to natural disease entities. Kraepelin assumed that dementia praecox had a biological basis, probably in systemic autointoxication, but thought psychiatry should resist etiological speculation in favor of classification based on clinical observation. Leading American psychiatrists could not easily abide such restraint. In the first two decades of the twentieth century, dozens of articles appeared in the psychiatric literature trying to establish a specific neuropathology for dementia praecox, or compiling laboratory data of various bodily functions of praecox patients to try and identify evidence of autointoxication or “endocrinopathy.” Despite initial enthusiasm, none of these studies shed much light on the causes of madness, but Noll argues they did serve to demonstrate that psychiatry shared the sort of methods and concerns that characterized modern medicine as a whole. They also encouraged some unfortunate adventures in therapeutics. Convinced that the cause of dementia praecox was autointoxication, Bayard Taylor Holmes, a Chicago surgeon whose son was stricken with the disorder, developed a surgical treatment that involved removing part of the appendix and maintaining an open appendicostomy to allow for frequent direct irrigation of the bowel to remove the infectious material that he believed was the cause of mental derangement. Holmes’s first patient – his son – died of complications following the treatment, but he claimed modest success in the more than twenty patients he and his associates operated on. Others, most notably Henry Cotton at the Trenton State Hospital, developed similar surgical treatments that generated initial excitement, but ultimately failed to produce meaningful results. Hundreds of patients suffered the painful and often fatal consequences of the therapeutic optimism fostered by biological theories of dementia praecox. Meanwhile, many other American psychiatrists, led by Meyer, grew scornful of narrow laboratory approaches to psychiatry and began to approach dementia praecox as a psychodynamic disorder whose origins could be found in a pre-morbid personality type marked by psychosocial introversion, disorganized habits, and maladaptive psychological reactions to the biological, social and emotional challenges of life. The search for psychogenic causes of dementia praecox led Meyer and his followers to pay increasing attention to the peculiarities of individual patients, thus moving them away from mainstream medicine’s concept of diseases as discrete entities that could be isolated from the particularities of individual patients. By the late 1920s, most psychiatrists intent on finding the psychogenic roots of insanity began to use the term schizophrenia rather than dementia praecox. Noll argues that this represents more than a simple change in nomenclature, as is often suggested, but a fundamentally different approach to psychiatry that emphasized psychological reactions as holding both the key to diagnosis and a potential means of treatment. The concept of schizophrenia proved especially attractive to more doctrinaire followers of Freudian psychoanalysis who became the dominant force in American psychiatry in the 1940s. In an epilogue, Noll makes explicit the critique of eclecticism in American psychiatry implicit throughout the book. During the period in question, psychiatric elites like Adolf Meyer embraced ambiguity, making room under Meyer’s capacious notion of “psychobiology” for conflicting theories and practices, ranging from psychosurgery to psychoanalysis. Noll acknowledges that Meyer’s eclecticism was in part at least a “pragmatic response to clinical perplexities” that “imposed a fragile peace on rivals in the service of “the greater goal of restoring maladjusted individuals to society” (276). Though Meyer and even more the early psychoanalysts were committed to a psychogenic approach, they understood that biological research and somatic treatments were essential for the prestige of the profession. But Noll argues that this eclecticism kept alive a tendency to emphasize the peculiar expression of disease in each individual rather than identifying the general characteristics that other branches of medicine used to demarcate specific disease entities, and ultimately marginalized laboratory research and statistical methods, and inhibited psychiatry’s integration into the increasingly powerful and prestigious modern medicine. The enforcement of doctrinaire psychoanalysis in the 1940s and ‘50s was an attempt to solve the problem by constructing a rigorous theory of psychogenic disease that could rival the explanatory and therapeutic power of biomedicine. But psychoanalysis was plagued by ambiguity and paradox and ultimately failed. From the 1960s on, progress in biomedical research into brain chemistry, psychopharmacology and genetics provided the basis for the rationalization of psychiatry that culminated in the triumphant return of Kraepelinian psychiatry as embodied in the DSM-III of 1980. Many historians will take issue with some or all of Noll’s critique. I tend to take the clinical perplexities psychiatry has always faced more seriously than Noll, and find grounds for skepticism whenever psychiatric theories of any stripe have arrogantly asserted that the fundamental ambiguity of mental disorder has finally been vanquished by science. But the great strength of this book is that it invites intellectual engagement. Noll does not allow his own interpretive commitments to overwhelm the narrative; his representation of the world of American psychiatry during this critical period is so rich and nuanced that readers are able to develop alternative interpretations even as they consider his. In other words, it generates much more light than heat and should be widely read by historians, neuroscientists, clinicians, social scientists and educated general readers interested in understanding medicine’s efforts to come to terms with mental illness. Given the issues at play in the upcoming revision of the DSM, a work of mature, responsible historical scholarship is a timely and valuable contribution to the broad discussion we need to be having about what is at stake in psychiatric classification. Jesse Ballenger is an associate professor in the Science, Technology, and Society program at Penn State University. He is the author of, among other works, Self, Senility and Alzheimer’s Disease in Modern America: A History (Johns Hopkins University Press 2006). Fullinwider covered this ground in 1986, why is he left by the roadside here ? Why is their no comment on Kraepelin’s idea that psychotics are a drain on resources that should be used to make “superior human beings” (Cf E Engstrom in history of psychiatry) ? Kraepelin confuses the clinical with the ideological and sees the world with the eyes of a botanist close to the extreme right wing of 1919. Is Bereavement Counseling the Victim of a Statistic With a Life of its Own?